Try our PHILADELPHIA Easy Fruit Pizza for a sweet serving of happiness. 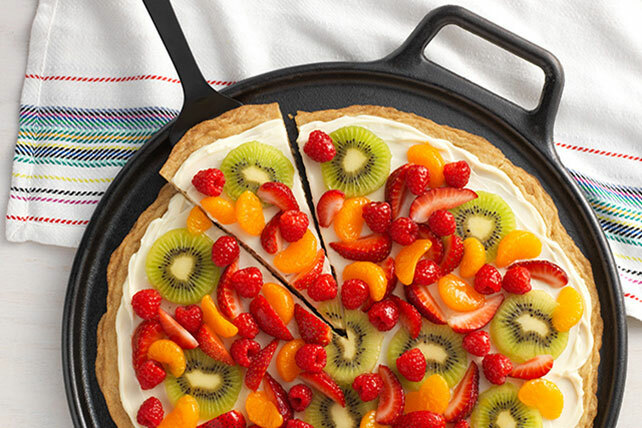 With a cookie crust and cream cheese center, this easy fruit pizza will please all! Line 12-inch pizza pan with Reynolds Wrap® Aluminum Foil; spray with cooking spray. Arrange cookie dough slices in single layer on bottom of prepared pan; press together to completely cover bottom of pan. Bake 14 min. ; cool completely. Invert cookie crust onto plate; carefully remove foil. Turn crust over on plate. Press preserves through sieve to remove any lumps; discard strained solids. Mix preserves with water until blended; brush onto fruit. Refrigerate 2 hours. You'll know it's a special occasion when you get to enjoy a serving of this delicious fruit pizza.